Mark Evans has this to say “The star anise plant actually belongs to the fennel and parsley family and its amazing star-shaped fruit have a characteristically aromatic, sweetly medicinal and pleasant fragrance that is similar to that of anise, but with more full-on liquorice and piercing spiciness. As with all liquorice smelling oils like liquorice itself, fennel, aniseed, aniseed myrtle and tarragon, this CO2 extract contains a high proportion of anethol and estragol which you should be aware of. 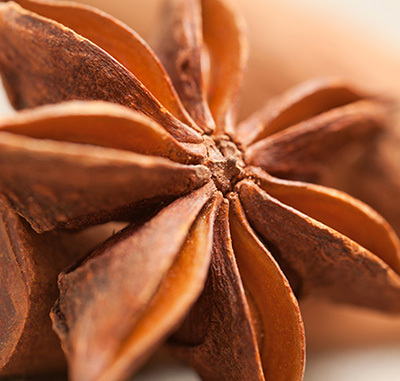 It is hard to put in words how greatly I love Star Anise. To me, it smells of freedom, of growing up, of finding something special in the world and holding on to it no matter what. This is ‘electric blue’, like a lightning bolt from Heaven. I feel hopeful sniffing it. This offering presents Star Anise in some kind of ideal form sculpted from my best memories and dreams alike. It is luscious, herbaceous, fizzling, suave, delirious. I’ve used it to cook and the result was one of my best dishes ever. I want to put into every blend I make and have to take deep breathes to focus and ponder properly. It can be used with herbs, bitter or sweet, in order to create faerie-like scenarios in the mind’s theater. Blended with Patchouli and Vetivert, it instantly turns them into sacred ground. Woods irradiate beauty with a tiny drop of it. It can perfectly be the star of a creation, perform a key role or just add support to a grander project. A little goes a long way and you’ll rarely see the need for more than 2 drops, and diluting also opens many possibilities here. It’s a must buy if you’re into licorice.